And with that, tonight's sitting comes to an end. MEPs will be back tomorrow from 08.00 BST, when first up they will be debating plans for a new border system in Schengen area. A debate on sexual harassment will follow, after which MEPs will take a position on the EU budget for next year. People smuggling and economic policy will be debated in the afternoon. MEPs will also debate EU trade talks with Australia and New Zealand. Finally tonight, MEPs are debating an advisory report from the civil liberties committee about tackling discrimination against Roma people in Europe. The draft says that the 10-12m Roma living in the EU are subject to “structural” discrimination in areas such as housing, education and employment. It accuses member states – without naming countries – of a “lack of political will” in securing their rights and a willingness to blame them for their “social exclusion”. Among its recommendations is the establishment of an EU truth and reconciliation commission to examine the “persecution, exclusion and disownment of Roma throughout the centuries”. MEPs are now debating proposals to add eleven potentially carcinogenic materials to the list of substances subject to EU exposure limits. The new legislation will also lower the existing exposure limits for hardwood dust and vinyl chloride monomer, which is mainly used to produce PVC. The new standards will mainly affect businesses and workers in the construction, chemical and car-making industries. MEPs have reached an informal deal on the new rules with member states which will be put to a final vote tomorrow. The leader of the Socialist and Democrat group, Italian MEP Gianni Pitella says the killing of Ms Caruana Galizia is an "attack on European democracy". "Whoever carried out this attack is an enemy of Europe", he adds. Dutch Liberal MEP Sophia in't Veld says the Maltese government must launch a murder investigation, but that the issue goes wider than that. The European Parliament needs to continue her investigations into money laundering and corruption, she adds. European Commission deputy chief Frans Timmermans says it appears Ms Caruana Galizia was killed by someone who "wanted to stop her reporting". He says the European Commission "very much agrees" that an independent investigation into her death "must be the top priority now". He says that "wherever useful", the EU's police and justice co-operation agencies are "there to help". He adds that "too many journalists" are threatened in Europe, and that the right of journalists to report effectively must be guaranteed. MEPs have now been joined by EU Commission deputy chief Frans Timmermans to debate the protection of journalists following the death of an investigative reporter in Malta last week. A government spokeswoman has said this assumption was based on initial results of an investigation into the explosion in Bidnija, near Mosta. Caruana Galizia was known for her blog accusing top politicians of corruption. European Parliament President Antonio Tajani has previously called for a full investigation. MEPs are now discussing whether to sign off spending by the EU Council of Ministers and the European Council during the 2015 financial year. Their report, which will be voted on tomorrow, calls for a detailed breakdown of costs incurred by the delayed completion of the new Europa building in Brussels. It also calls for the European Council budget to be formally separated in the EU’s accounts from the Council of Ministers, where national ministers meet to discuss new legislation. Responding to the debate, budget commissioner Gunther Oettinger says the Commission is "looking" at the issue of pre-accession funds to Turkey. It should be a "special priority", he adds. He says the Commission will also be producing a document showing where they is "wiggle room" to adjust programme spending, which should speed up negotiations. How is the EU budget set? The EU budget for each year must be within the limits specified by the long-term budget, the Multiannual Financial Framework (MFF), which runs over a seven-year period. The long process over setting the budget normally begins each spring, when the European Commission publishes its initial draft proposals. The national governments then take an initial position, normally in the summer, before the Parliament adopts its stance in the autumn. If there is a difference between the positions, then “conciliation” talks begin, where the various participants thrash out their differences behind closed doors. The European Parliament must approve annual budgets before they can come into force. UKIP's Jonathan Arnott says the issues raised in this year's budget debate are "pretty much the same" as in previous years. Talking about EU spending as a proportion of gross national income (GNI) doesn't "tell the whole story" because the share compared to government spending is often higher, he says. He calls for "genuine cuts" to the EU budget, as he believes project funding is "better and more efficient" coming directly from national governments. On behalf of of Estonia's EU presidency, special representative Märt Kivine says national governments will focus on funding projects with the "highest European added value". He says this includes promoting jobs and growth,security and migration - and notes that no "priority areas" will see funding cuts next year. EU states are "significantly concerned" about budget increases proposed by MEPs, he says - although he says the gap in starting positions is not as big as in some previous years. 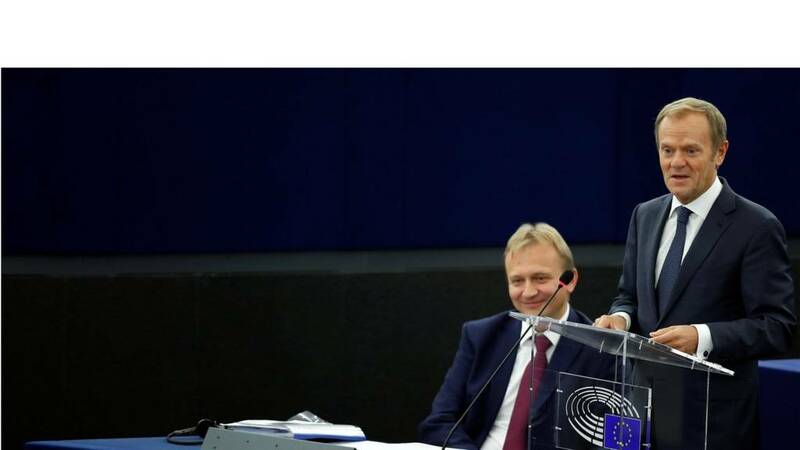 Romanian centre-right Siegfried Muresan, one of the European Parliament's lead budget negotiators, says their spending plans are "realistic and honest". He says the European Commission's plan was a "good starting point". He calls for more pooling of defence spending at an European level, as well as more cash for programmes in potential future EU countries. However he says that pre-accession funds to Turkey "should be reduced" given that the country is "drifting apart" from the EU. MEPs are now debating next year’s annual EU budget with the budget commissioner Gunther Oettinger. Tomorrow MEPs will set out their position on spending ahead of formal negotiations with the EU Commission and member states. Their draft position proposes to increase the budget proposed by the European Commission and reverse cuts suggested by the member states. This would set the budget at €162bn in budgetary commitments, with payments made during the year to total €146bn. Portuguese centre-right MEP Jose Manuel Fernandes asks for greater clarity on the amount that will be given over to the euro area budget line. German social democrat Udo Bullman says that he is in favour of the setting up of a European monetary fund. However, he says that MEPs must "have some control" over how it is run. European Commission deputy chief Frans Timmermans tells MEPs that before May next year the Commission will table a "limited" number of proposals in priority areas. He says this will include proposals to enact a dedicated budget line within the EU budget for the euro area and a European Monetary Fund. There will also be plans tabled to set up an EU labour authority, an initiative to give workers in the so-called gig economy greater access to social protection, and a proposal for "fair taxation" in the digital economy, he says. Longer-term measures to be tabled include plans for a euro area finance minister. Hello and welcome back to coverage of this plenary sitting of the European Parliament in Strasbourg. MEPs have been joined European Commission deputy chief Frans Timmermans to debate the EU executive’s legislative programme for next year. That’s today’s voting session finished – MEPs will now have the opportunity to make short speeches explaining their votes. After this there will be a break, after which the sitting will resume at 14.00 BST. First up, MEPs will be joined by the European Commission’s deputy chief Frans Timmermans to debate its legislative programme for next year.